RICHARD LARTEY BELIEVES he has been the avoided man of the heavyweight division. The 14-1 Ghanaian with 11 KOs to his name has fought just once outside of his native Accra when he travelled to Berne and suffered an injury-enforced defeat to the unbeaten Ergun Mersin in December 2014. He will now embark on a long-awaited second away voyage to take on the 10-0 heavyweight star in the making Daniel Dubois at the SSE Arena, Wembley on April 27, live on BT Sport. For Lartey, a big-punching trade-off with Dubois represents an opportunity to really announce himself in the heavyweight division and make a statement to his fellow ranked contenders who have chosen to bypass him. “Heavyweights have been avoiding me for a long time now, when I knock out Daniel Dubois then I cannot be avoided any longer!” said Lartey with intent. “My goal is to become the world heavyweight champion! Lartey’s school of thought is that the clutch of highly-rated young heavyweights in world boxing are nothing but pretenders who always enjoy home comforts against easy touches. “People talk too much about young heavyweights who have achieved nothing and beaten nobody. I am happy to do it the hard way and beat these people in front of their own fans. RICHARD LARTEY CLAIMS that his April 27 heavyweight opponent Daniel Dubois has been spoon fed a diet of mismatched opposition across his professional career to date. The Ghanaian, 14-1, takes on the 10-0 Dubois at the SSE Arena, Wembley – live on BT Sport – and will attempt to halt the impressive rise of the 21-year-old Londoner, who has drawn comparisons in some quarters with the progression of Anthony Joshua at the same stage of the Olympic gold medallist’s career. Dubois has already collected four belts in his ten fights so far – the WBC Youth, Southern Area, English and WBO European – and is already ranked in the world top 15 by the WBO. His career path has done little to impress Lartey, whose only defeat came via injury-enforced retirement. The Accra-based heavy insists the race towards world title contention will be won by him. 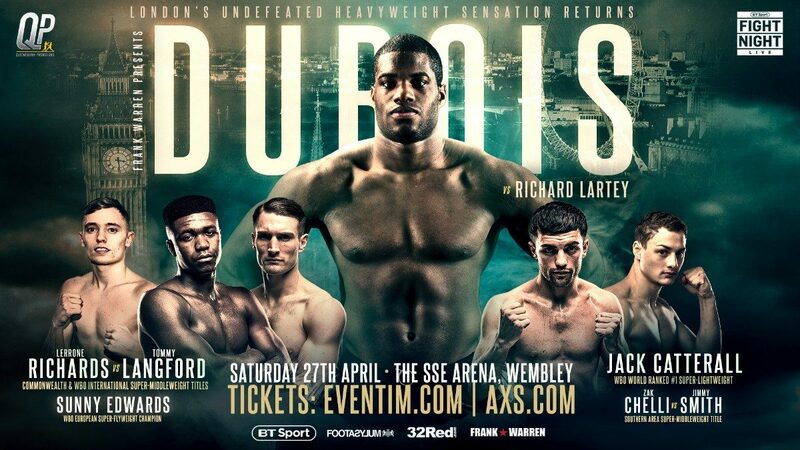 Daniel Dubois (10-0) v Richard Lartey (14-1) tops the bill at the SSE Arena, Wembley on April 27 on a card that also includes the Commonwealth super middleweight title fight between Lerrone Richards (11-0) and Tommy Langford (21-3), as well as the Southern Area super middleweight title clash between Zak Chelli (6-0) and Jimmy Smith (7-1). WBO number one rated super-lightweight Jack Catterall (23-0) is in action, WBO European super flyweight champion Sunny Edwards (10-0) and WBO European super featherweight champion Archie Sharp (14-0) also feature. There are Queensberry debuts for unbeaten welterweight Chris Kongo (10-0) and Sheffield middleweight Shakiel Thompson (2-0). Caoimhin Agyarko (2-0), Bilal Ali (1-0), Denzel Bentley (9-0), Alfie Price (4-0), Hamzah Sheeraz (7-0) and Umar Sadiq (4-1) also have outings. Tickets will be priced as £40, £50, £75, £100 and £150 and are now ON SALE to purchase via Eventim, Ticketmaster, the SSE Arena website and AXS.com.